While making a shopping list isn't necessarily a complicated endeavor, it is very easy to forget to put something on your list that you realized you needed during the middle of the week, and also easy to overlook something on your list while you're in the store. That's where making a grocery shopping list can feel complicated. You've got to have a system in place to keep that from happening on a consistent basis. Scroll down to the ideas shown below to get some ideas for how other readers who have taken the healthy meal planning and grocery shopping list challenge have taken on this task. If you've got an idea to share I'd love to see it. You can click here to share how you do it in the Home Organization Hall of Fame, and the best photos will be featured on the site. 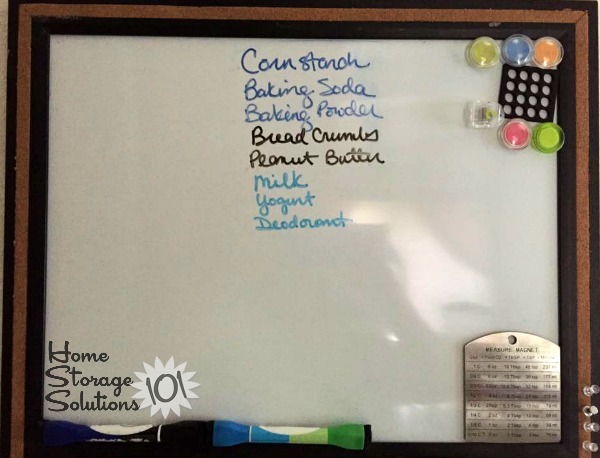 A reader, Sheryl, sent in this photo showing how she uses a white board to jot things down as she runs low or out of an items, so she remembers to place it on her list before she goes grocery shopping. This is a simple, yet very effective way to remember all those little things, like spices or other ingredients that you may use up over the course of the week, so you can keep everything well stocked and not realize, in the middle of cooking, that you should have remembered to buy something at the store earlier in the week, but you forgot. 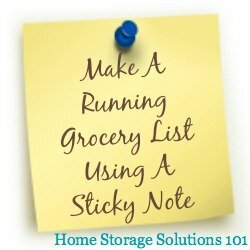 In fact, instead of rewriting the list when you need to go to the store, instead just snap a quick photo of it on your phone and take that with you! I have mine split between Sam's where we bulk shop on the right and Walmart and King Soopers/Safeway on the left. The bottom box is for quick notes if I'm on the phone or if we have items we need from places like Lowes or Home Depot for example, such as a filter cartridge for the fridge. My husband and I can add to the list and then I take a picture and send it to both of us as we head out to the store. Then when we get to the store he knows what we are shopping for too and I don't forget my list. A similar method to the whiteboard shown above is to use a chalkboard. 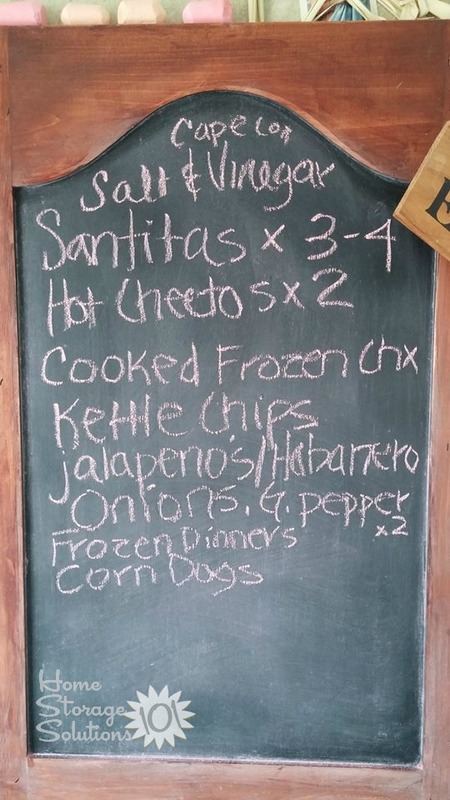 A reader, Patty, sent in the photo above, and said, "I have chalkboard we write things on and also use a master list by aisle I made in excel. I shop at 3 different stores so I have each list in excel. I take a photo of the chalkboard and add to the lists before big shopping. Or if it's a quick trip I just use the photo." Tina did something similar to those readers above who use a white board, but she used chalkboard paint on her refrigerator. She said, "I used blackboard paint on the top of my old fridge and then just take a pic on my phone of the list to take shopping." 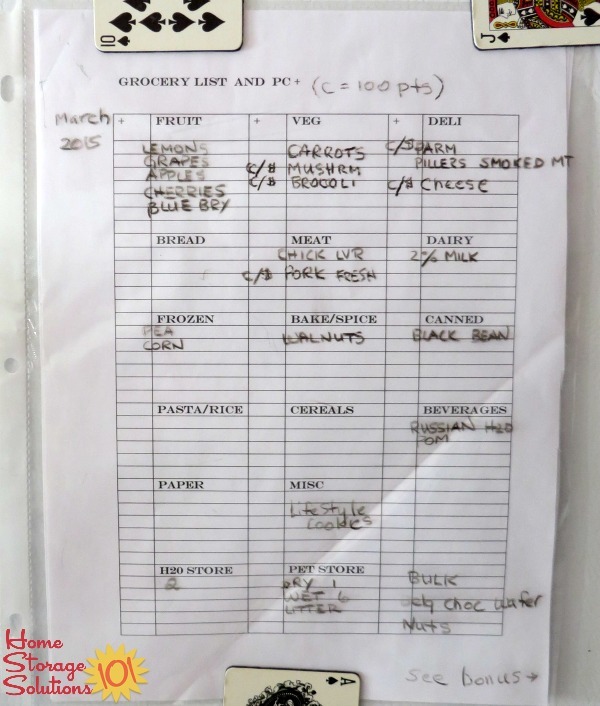 Lisa has shared how she makes her grocery list, and I like the simplicity of her system. I tried several printed versions of grocery lists. I have found over the years what works best for me is to write my grocery list on a business size envelope (I think they are size 10). Then I put the coupons I need for that trip inside the envelope and off I go. Lisa, I love the simple elegance of your system. Plus, you've solved two birds with one stone since your system also solves the problem of how to keep track of your coupons while at the grocery store. Thanks for the great idea! Kimberly says: I do this too! If I am going to be shopping at a few different stores I make an envelope for each store. I recycle every envelope I get, whether it be from a bill, occasion card, all of them. Emily sent in the photo above saying, "I love having a running grocery list! 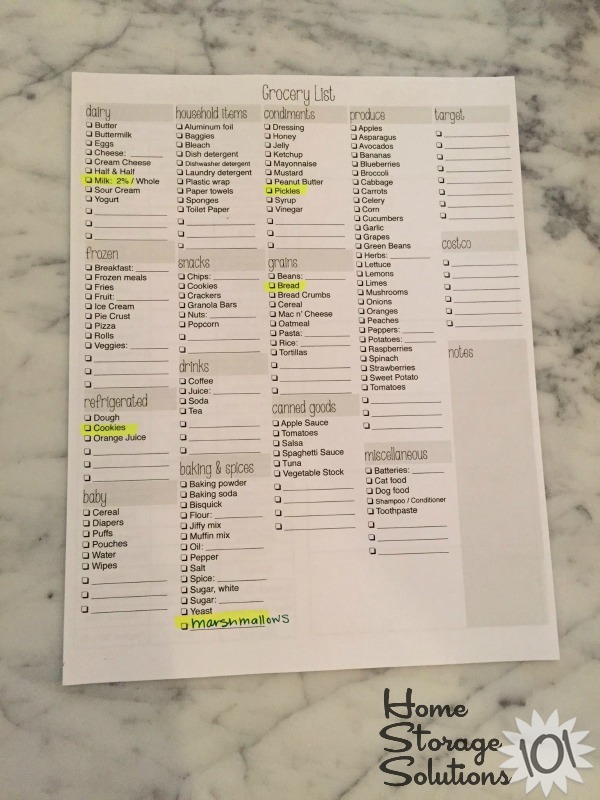 I highlight what we need after I make the meal plan (which is on the other side of this page) and I also highlight the item right when we run out of it so I'm sure to pick it up the next time I grocery shop." Similarly, another reader, Kathy, said, "I have a menu calendar for the month where I write in the meal for each day of the month. I use a master list of meal suggestions developed from family favorites and my cookbook. It allows for meal diversity and makes grocery shopping planning much easier. I developed a master grocery list of just about everything in my kitchen which I print off from my computer as needed. When an item gets low, we highlight the item in yellow. Before I go shopping, I double check the list against the menu calendar and highlight anything I might need. On the back side of the print out is the list of items commonly purchased from the wholesale clubs. When a bulk item start to run low, that item gets highlighted also. So, using the monthly menu calendar and the grocery printout with highlighted needs, we have found our grocery bill to be lower since impulse buying is decreased. The grocery list is so much easier for my family since, for some reason, they are more likely to highlight a need more so than actually writing the item down. And having the list layout already set up for the store (i.e. produce, dairy, cereals, frozen section, etc), makes it easier for them to find the item listed and easier for me to shop the store. It is easy to add and remove favorite items using the computer. It is just a word file set up in 4 columns. Taking a half hour at the end of a month filling in the menu calendar saves so much time come dinner prep time. And my hubby can start a meal ahead of me since he can look at the menu calendar posted on the inside of the cabinet next to the stove. This method has prevented so many back trips to the grocery store for items missed." Thanks for sharing this Kathy. I definitely think that sounds like a wonderful method. 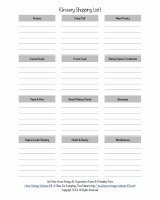 I agree that a personalized template or list is best, but for those who don't want to make one I've created printable grocery list template that you can use. 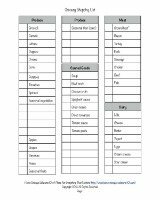 It has lots of common staples listed for you in this three page printable. In addition, I've made a much simplified grocery list template that is just blank, but organized by major sections of the store so you can group items together on your list and not have to backtrack for forgotten things later in your list. In fact, one reader, Jane, used the suggestions I made in some of the printables above, and them made her own personalized list. She explained, "Here is what I came up with for a grocery list that does not have to be copied to any other paper. Using Taylor's list as a jump off point I added a few things of my own and rearranged it to suit my store. I hang it on the fridge in a plastic protective sleeve. I have a grease pencil hanging there also to write on the plastic sleeve. I can take the whole sleeve to the grocery store and wipe out the items as I put them in the cart. Things I don't get will stay until next time. Saves paper and time in the store. So thanks once again for the inspiration Taylor!" One reader wrote in to explain how she uses her phone for her list. She said, "I use the notes section in my cell phone. I keep a running list in there. Add things all the time, delete them when they're bought. No waste." 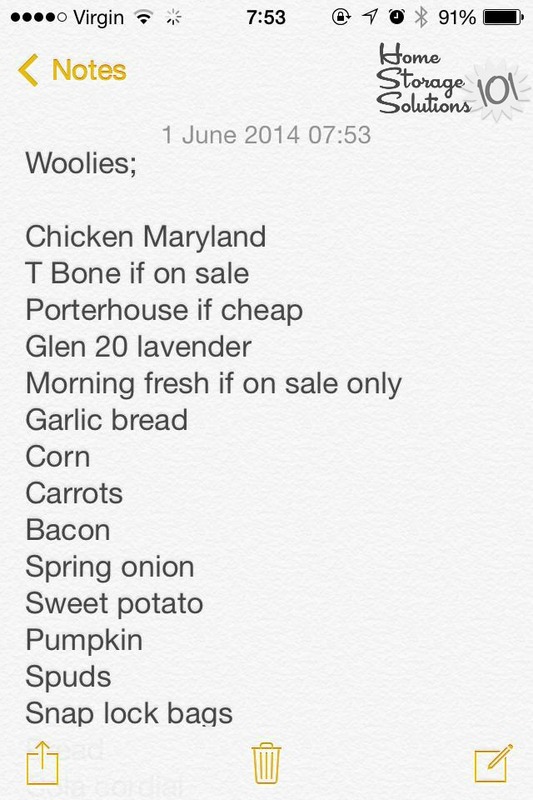 Similarly, another reader, Misses Burton, sent in a screenshot of her grocery list on her iPhone. I used to use the notes app for my grocery lists and then a friend showed me how much easier the Reminders app on the iPhone is. I add lists for each store and then check off each item as it's purchased. The app will show you what was already purchased and what still needs to be purchased. It works wonders! My husband and I use the Reminders app (stock app) on our iPhones. He set it up to where they sync with one another so he can add something to our list and it shows up on my phone. I keep a pad of super sticky post it notes on my laptop and make my grocery list on one. As I need to use the riding carts due to a disability I can easily stick the post it on the large steering column center and see everything at a glance. I also have a mini sharpie on my key chain that I use to cross off items as I go. Of course no discussion of making a grocery list would be complete these days without mentioning that lots of people now use a grocery list app to create their list, and take it to the store right on their phone. There are so many different apps available, so I can't discuss them all right here. However, lots of readers have shared reviews of various apps and I'm including links to these reviews in case your interested in using this method. Do you have an app you like to use for this purpose? If so, I'd love to hear about it. You can submit your app review here and I'll add it to the site and this page! I'm not sure exactly where you can get ones of these little signs anymore, but a reader, Diana, sent in this photo and I thought it was really cool. She said, "Grandkids help me use this cool little sign that my daughter bought me ages ago. It hangs in my kitchen and works very well for us." Cortney from Faith, Home, Love shared how she makes a grocery list that she can take to the store with her, to help her buy what she needs for the week, with her coupons. As you can see from the pictures she uses several of the skills we've discussed in the 52 Weeks to an Organized Home Challenge, including couponing and meal planning together, when making her list. 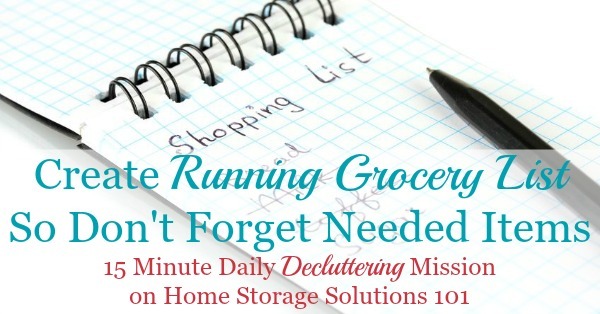 She explained that her list is in a "hard folder that easily sits up in the grocery cart and helps me stay on track in the stores." 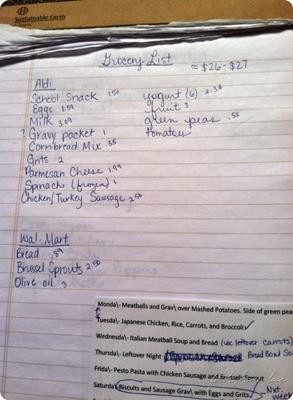 In addition, on her grocery list she writes the price of each item down, before she even begins to shop, so they can stay within their budget. You can track your own rock bottom prices, to know when you're getting a good deal, with this grocery price book. 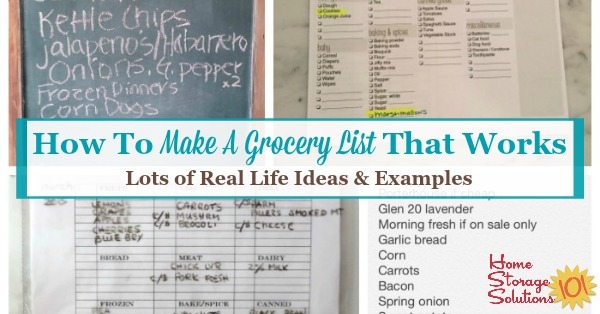 I hope these ideas have inspired you to organize your grocery list to help you at the store. If you'd like more instruction, I urge you to join the Healthy Meal Planning and Grocery List Challenge. Then, when you set up a good system in your home I'd love it if you shared some pictures of it here on the site. 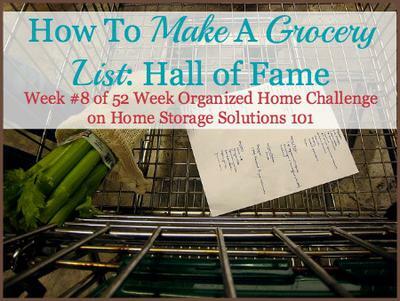 You can share your Home Organization Hall of Fame pictures and tips here. Plus, if getting this area of your life organized gets you motivated I'd love for you to join the 52 Week Organized Home Challenge. When you do you begin to slowly, over the course of the year, get your whole house organized, one room or type of item at a time. I use the white board so everyone can add items as we run out. But I use used envelopes for list - declutter! I copy the white board list to the back of an envelope and put coupons I know I will use in the envelope. I admit carrying a coupon binder to the store just in case I find a great sale- but having planned coupons in an envelope means less shuffling through a binder in store/at the register. Heaven help the kid who uses the last paper towel without putting it on the list!!!! I have a spiral notepad and I write my grocery list on in order of the aisles and mark off as I go. I will also calculate cost as I go. I keep track of when items are low and stock up if it is something I use a lot like stocks. My notebook sits on the kid seat area so I can just look down as I go. I've tried so many different apps and options and I've returned to simple. The family adds items to the white board as they finish or get close to finishing. I make my menu plan, my list, add items from the board, and review my last list to see if there was something I was unable to get last week. I tape a piece of paper on the front of my refrigerator door. And as I use things when the item runs out I put the item on my list. That way when I go to the store I know what I need. And my family can add to the list of items they feel they need. It works really well. I keep a master list posted on my fridge where I'm most likely to see the list and remember to add needed items. Another good idea is to have multiple 'master' lists. That is have the all inclusive master list in the kitchen, but also have smaller 'master' lists for other areas where needs are more specific and likely different than in the rest of the house: (e.g. a laundry room master list, master bath, kids bath, extra bath). I have started using a grocery list with check boxes in front of each item. The list stays on the fridge (as well as a pen) and we check the item when we realize we need it. I have a printable list of things that I need to have in the house all the time, including ingredients to make a variety of family favorite meals. Before I shop I check the fridge and cupboards and tick the items that I need. I also have a space for unlisted extras (eg. for a new recipe I want to try). Oh and it's in the order of my supermarket aisles. Chalkboard wall in kitchen, anyone needs something write it there. Every Monday I take a photo of it, shop and bam nothing forgotten. take picture of your whiteboard! I have a whiteboard in the front hall next to my kitchen. I write whatever I think of on it when I think of it, then snap a photo with my phone as I'm headed out the door. When I'm done, I delete it. Saves paper and I never forget anything! I like most people just make a list on my phone. But recently started taking photos of the fridge and pantry. That way I can see what I've got already and work it out that way. Works well. I've put clear contact on my white fridge... Instant whiteboard for my shopping list... I take a photo of it before I leave. I also keep a monthly menu calendar on google docs so I can access it from anywhere, even my phone while at the store. I highlight the foods on the menu that I need to purchase. Then at the bottom of the calendar I write the specific ingredients I need to purchase. Painted our pantry door with chalkboard paint. As the week progresses hubby and I put stuff up whenever something gets used up. Just a quick jotting in my planner and I'm off to the store. Plus it's a constant visual reminder. The regional grocery store for the store chain I shop at posts their sales ad every Wednesday. It is a "click and add", then I check it over and print. Anything I need that is not on the ad that week is written down in the appropriate category. I use a file folder with one open side to hold my list. 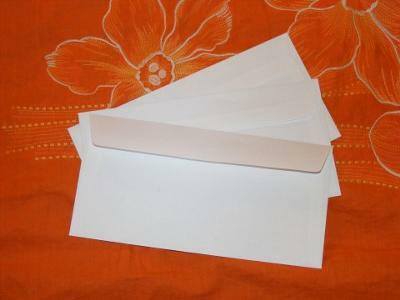 An envelope with the coupons I intend to use goes into the one open side. I've been shopping my pantry and freezer so that I have avoided going to the grocery for 3 weeks (with the exception of 2 gallons of milk.) When my regional grocery posted their weekly sale ad for next week I looked at what was on sale, and then searched the web for recipes using that item. I like to try new recipes several times a week, so I add the chosen recipe to an electronic folder bookmarked on my laptop. I add the ingredients I will need to my grocery list that is written on a legal pad attached to a clipboard that I keep in my kitchen. That list also has items on it that need replaced. The list is written in the order of the aisles I shop. Lastly I check my coupons, place them in an envelope and clip them under the clipboard. The list also indicates the sale price for the item from the ad. No longer shopping for shoppings sake. Just buying what I need to make for those specific meals. I have used a spiral for 35 years. With the spiral folded, on the right I list our meals for the week and on the left the grocery list. I have been able to go back to look for ideas of what to have, and to see what we had last year for holiday meals. I don't save these, but I've enjoyed having all my info in one folder and not scattered all about and lists that are thrown away. It's been rewarding! Recently, I started to use Pepperplate on my smartphone, but there is also a Dollar store grocery list pad stuck to my fridge. Those items get copied to the phone before I leave for my grocery run. I have a spiral notepad that I write down what I need. I created 3 columns. One for "need now", one for "need" (see comment below), and the 3rd column is labeled "want". I always aim to have one item in use and one item in the pantry. Example: Toilet paper, have one package of rolls in bathroom, one in pantry. When I run out in bathroom and take the one from pantry, I add TP to the column "need now" on my shopping list. If the item is something that will take a while to run out of, for example a package of 6 bars of soap, then that item would be in the col "need", which is an indication I do not have any in the pantry. I have time to buy this item, and hopefully come across a coupon. This method is also good for me, I'm not running through the house on shopping day, making a list. Sometimes if I don't want to take the time to write something down, I will take the empty package and place on the kitchen counter as a reminder. I use an app called Color Note. I can do a checklist of the items I need. I put grocery store items at the top and other items at the bottom. It's so easy to add an item and i just tap on the item to mark it off the list. If I need someone else to go to the store i can hit "send" and email it or text it to them (they don't need the app). 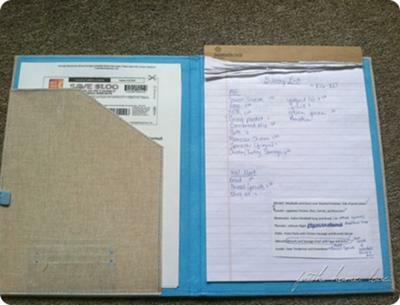 For years I have had a clipboard, complete with pen, left in an unusable section of countertop. About a month ago I lost it. Probably left in a cart. I replaced it with one that is about an inch high and has a storage compartment under the writing top (affiliate link). Great place for receipts instead of my purse. Why use a whiteboard when you could just write it on a piece of paper? Why not have a designated place to keep your notepad and pen in your kitchen and write your items down on it? You have your list ready and you don't have to transfer from white board to paper or phone list later. Remove the page and go! Get the Out of Milk app for your phone. It is fantastic. 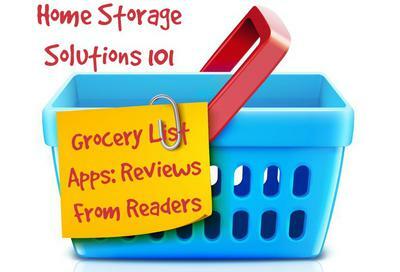 Grocery list or any shopping list has never been easier to organize. I have a notepad with a magnet on the back. I write down what we need as we run out, then I can just take the list with me. I make my list in a note on my iPhone. I never leave home without it now. I made a list of everything in my pantry (after I bought groceries). I made 2 columns, 1 for what I need and 1 for what I have it already. A few days before I go shopping I go through and check off do I have it or do I need it. This way, as I go through the store I don't have to worry about do I need this. It's so much better for me to use my phone than to use pen and paper. My list is specialized due to medical and health conditions so I just jot down my weekly menu, take it to my pantry, click in what I don't have, check the grocery adds and pull it all together. Of course it's just the two of us so this might not work for larger families or multiple cooks. I love the idea of creating a grocery list from your notes app. I think I will definitely use this method from now on as I usually forget my grocery list at home! I use the Grocery IQ app. I love that I can just scan the UPC code on an empty package. I don't bother with coupons. (Grocery IQ links to a coupon program, but I haven't been able to get the software to print.) You can enter prices so that you have a general idea of how much you're spending. Grocery IQ has the ability to sort needs by store, and also to create a Favorites list. I am diabetic so I keep my basics on there, so I can reference it quickly and add on what I may have forgotten. 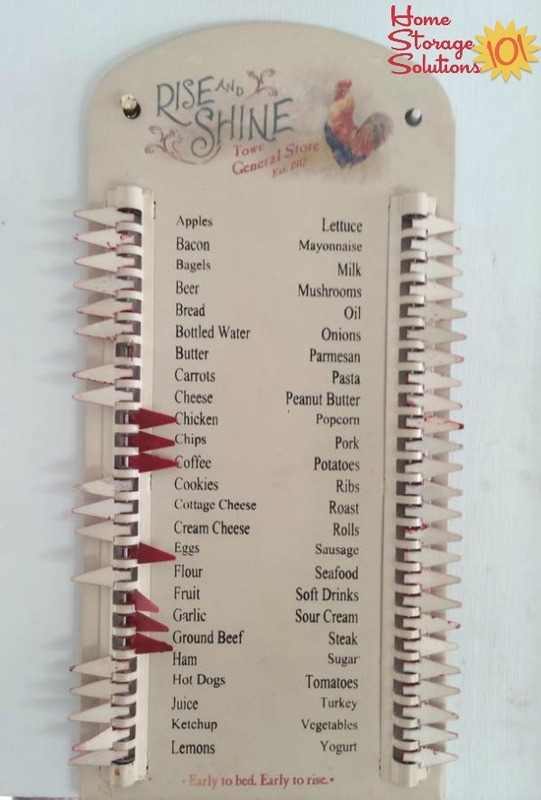 I have seen some very interesting versions of grocery lists, and may need to incorporate new ideas. I always keep a magnetic list pad on the fridge and use this for my grocery list. We write items on as we run out, and then finish it off Friday night using the grocery store weekly ad and recipes for the following week. That way it's ready to go for our grocery run on the weekend. If I'm feeling ambitious I rewrite the items in the order I will find them in the store to help minimize those trips back to produce when you're almost ready to check out! I've been using a master list since doing this challenge last year. It's organised to roughly map out the aisles of the supermarket I use and has plenty of space to add things we don't buy every week. I've also got a section at the bottom for items we get from the discount shop or buy in bulk online. I am still "educating" the rest of the household to tick off things when they use the last of it or we are running low but we are getting there. 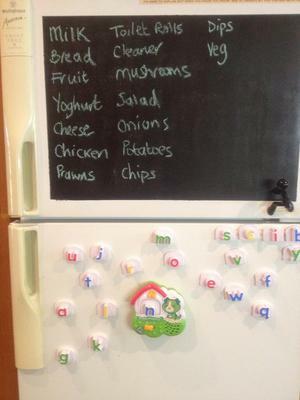 And I have a white board weekly menu planner on the fridge, the list goes below so I can tick off or add things that will be needed for each meal. I too have found it cuts down of food bills and particularly unused/wasted food plus makes shopping quicker and easier as there is no "thinking" time. I just keep a notepad next to the fridge and everyone knows to write down what is needed (trying to train them to write it down BEFORE it is gone). I've written each entree (with its ingredients) on a separate index card and had my fiance randomly pick 7 cards and that's how we get our menu for the week. Each item on the index cards have been put into a master grocery list (much like your template). I highlight the items needed for this weeks menu and cross it off when it's been added to the cart. Sundays and Wednesdays I look at sales items and circle anything on sale that I know I will use in one of our 30 different menu items or canned goods. I also see which items on the menu are on sale where, so I know which stores to hit to save money. Luckily they're all within a 5 mile radius, so it's not an issue to go to 3 different stores in one day! We have done this for years. 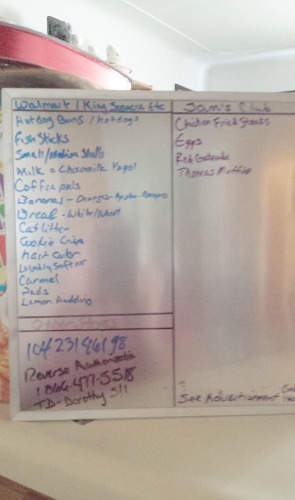 Whiteboard in kitchen, list for Costco, market, and other items needed. Then we double check pantry before we go into town, copy list onto paper. Now if I can learn to keep my list on my smart phone I would have it always. I use the Shopper App for my phone and kindle. It works great you can scan bar codes or enter the item in. To show that you have it in your cart you check the box. and it goes to the bottom of the list and is crossed out. I like that it gives you multi lists that you can make tailor it to a certain store. Such as I have a grocery, hardware, Ag store in mine as well as my groceries by month. If you tend to buy the same thing when you get home you can clear the list for next time. They also have recipes and other cool features and best of all its free!! Since moving to the farm this app has become my best friend for shopping. 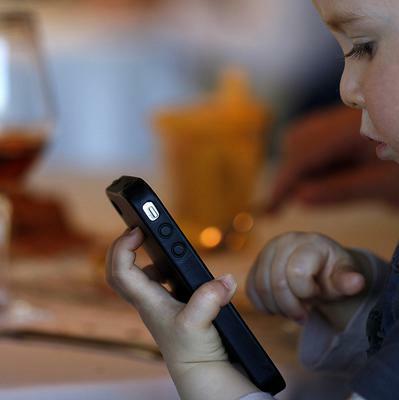 Every one in the family can add to it and 99 percent of the time everyone has their phone with them. I made my grocery list in excel. It is broken down per aisle at the grocery store. Each aisle has blank lines under it that I use to write the items I'm shopping for. Keeps me from going back and forth between aisles. It works so well for me. 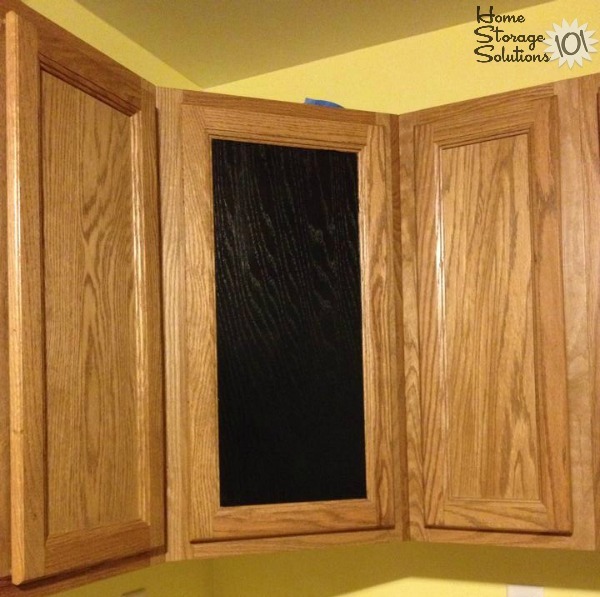 LOVE this idea of painting chalkboard paint on the cabinet. Although, it wouldn't work in my house. I don't think my husband would be thrilled at this idea of taking apart part of a cabinet door for this. However, I think the whole idea of "jotting down" what you are needing as you go along is a great idea. 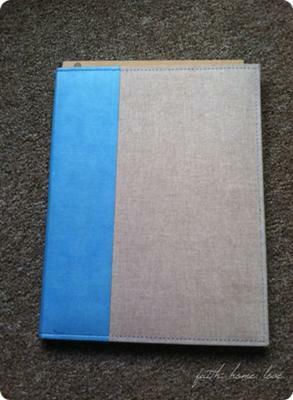 I have a "home management binder" I created months ago and I could easily have a page for jotting foods we need down. Then, from there I'd make my grocery list the day/night before grocery shopping as I always do. Cool idea...why didn't I think of this before?? Oh yeah...because I'm TERRIBLE at being organized and staying organized long enough. Eventually, the routines I create get boring and then I'm BACK to my old bad habits I tried kicking to the curb in the first place. Sigh...it's a vicious cycle. I begin my shopping list on Sundays. I use magnetized notes which I place on the fridge door and make it a running list for things as I run out of them during the week. On Saturday, when I put together my menu for the following week, I add to it all the ingredients I need to buy for the planned meals. I used to print my grocery list from an excel spreadsheet, and that worked. But after I got Evernote, I made a master grocery checklist, and I love it! It's simple to use the check boxes - I uncheck an item, when I need to buy it. It's also easy to add infrequently purchased items to the list anytime. I can update the list on my computer or phone and then sync them. This is great because I can add an item no matter where I am. My list is organized by the layout of the store I frequent most. But it is easy to shop at any store because the list is organized by item type with headings. I use a printed list with items that I usually buy printed in order like the aisles of the store and extra space to add other things so I like the idea of using the clear sheet protector. My list is only 1/ 3 of a sheet so I don't consider it all that wasteful to use a new sheet each week. I like the idea of erasing the items as you buy them. I have a habit of missing something that is on my list and sometimes the store doesn't have the items in stock so this would work very well. This is also great for shopping at several stores. I can mark off what one store has but still have everything on one list. I like having a preprinted list to help remind me of things that might not have gotten added to the list as they were used up and to remind me to check and see how much is left of the items that are used frequently that others in the house might not have put on the list. I did an inventory of everything in my kitchen and created a spreadsheet. I print a copy and circle what I need. I also make notes like brand preference. I also know what I have on hand. I made a Master Grocery List in my Notes App. When I run low on something, I put several quotation marks after the item on my list so it stands out. Once I purchase the item, I delete the quotation marks. This way I don't have to keep typing a new list. If I need to add something to the list, I type it in; if it's something that will get purchased again, I leave it on the Note, otherwise, I delete that item entirely once it's been purchased. Another excellent app for this is the Cozi app. It is free, with some of the features on the phone being for Gold members (a little $29 annual fee). I can be out, and a family member can add to the grocery list and it will automatically update to my phone. It also has a menu feature and a calendar feature, so that you know what you are doing as you are planning your meals. I have a perpetual grocery list on Google Keep app on my phone: one list for perishables that we buy regularly and a second list for staples that we keep on hand that last a while. When I buy something, I check it off, and it gets crossed out and jumps to the bottom of the list. When I run out of something, I "uncheck" that item and it pops back up to the top. So easy! I created the lists from my master meal plan, so everything we buy is already there. If we need a specialty item that's not on the meal plan, I add it to the end of the staples list. If you still have a white refrigerator use that! Just be sure you get the washable markers and not Sharpie! Or use washer! Or white metal file cabinet! I use a grocery list printed from my computer. It is listed per aisle from my favorite store. I highlight with yellow what I want. The list has my most purchased items and room for write ins. I have an aisle by aisle master list in the notes section of my phone, with check boxes. I go through the list with my menu plan, unchecking everything I need for the recipes, then go through the cupboards doing the same. If I think of anything midweek, I uncheck it right away. Doing the shopping is easy - just check things off as they go in the trolley! I make my list in the order that I would walk through that particular grocery store. I make a mark next to items that I have a coupon for, another notation if it is on sale. I use a paper to list those items that I am running out of. It is fastened to the fridge (right next to my kitchen work area). That way, all I need to do is finish the list and take it with me. No recopying from a chalkboard etc. I have a google sheets with all the different categories produce, dairy, canned goods, etc. and the final column has the name of the meals I'm making.